(VOVworld) – Microsoft Vietnam and the Audio Books Charity Fund for the Blind are sponsoring a year of free IT training courses for the visually impaired in HCM City. The programs’s three-month courses will be at the offices of the Audio Books Charity Fund for the Blind in Dinh Tien Hoang Street, District 1, Ho Chi Minh City. Classes meet on week days. Participants will learn how to use computers and the Internet to search for information online. The program will also provide vocational guidance and job support in HCMC. 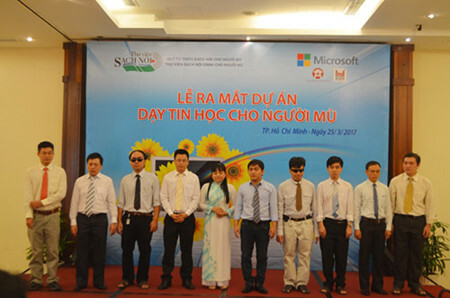 The program’s co-sponsors, the Tan Nam Do Company and the Vietnam Foundation, have donated 30 computers to the Audio Books Charity Fund for the Blind plus 77 “Laptop 360” computers specially designed for visually impaired users. 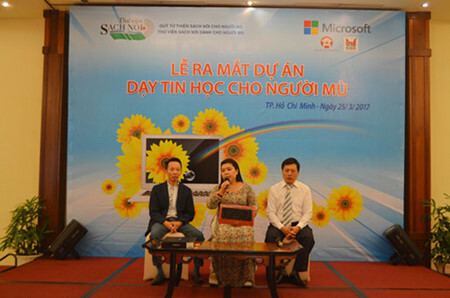 Each student who passes the final exam will receive a certificate of completion and be allowed to take home a “Laptop 360” computer.The course curriculum was designed by a group of visually impaired people with consultation from Microsoft Vietnam. All ten of the course instructors are themselves visually impaired individuals with university degrees. Class size will be limited to 7 to 10 students. Instead of using a mouse, the visually impaired users will rely heavily on the TAB key and voice activation and will memorize the position of every letter, number, and symbol on the keyboard. Next March, if the program proves effective, Microsoft Vietnam will expand it to other provinces. 26Nguyen Huong Duong, Director of the Audio Books Charity Fund in Ho Chi Minh City, said the program will open new opportunities for blind individuals to improve their lives. “The main goal of this program is to help blind persons connect to the world around them. Just like anyone else, they will fall behind if they don’t learn how to use a computer. We want to promote social equality by removing barriers,” said Duong.